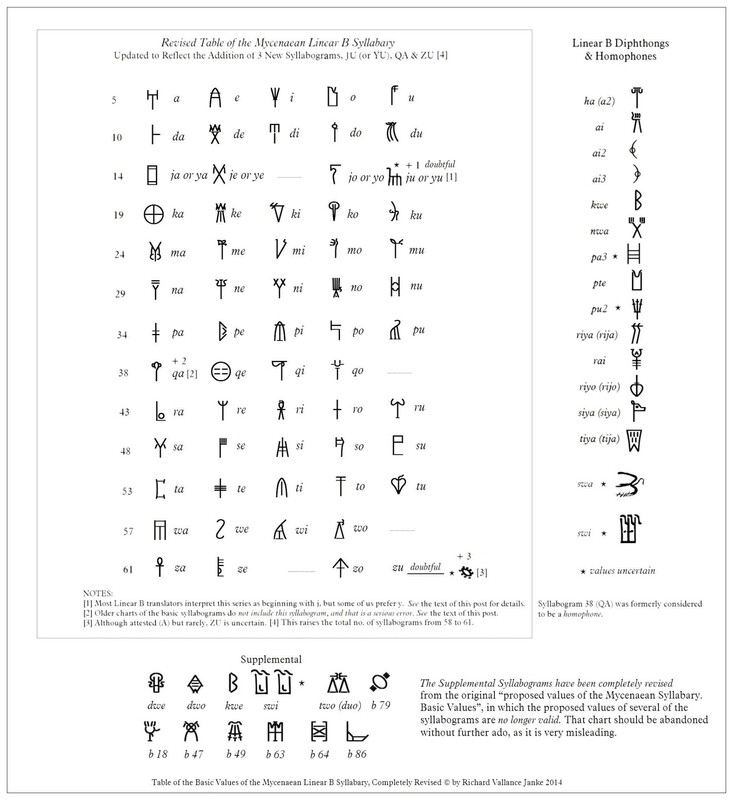 you should discard it at once and replace it with our new Table of the Full Linear B Syllabary Revised 2014, as the former is completely out-of-date and inaccurate. Until recently, almost all charts of the Basic Syllabograms in Mycenaean Linear B accounted for only 58 syllabograms, but this number falls short of the actual total of 61 Syllabograms. In fact, there are three syllabograms which are unaccounted for in almost all previous charts of the basic syllabograms, these three (3) being JU (or YU), QA & ZU. The chart above does account for ZU. Both YU and ZU, although attested (A) on all extant Linear B tablets and fragments, regardless of provenance, are extremely rare, so we need not fuss over them. How did the Mycenaeans Pronounce the J series of Syllabograms (JA, JE, JO & JU)? Listen carefully. You can easily enough tell that the sound of the consonant “j” is much softer in French than it is in English. That is the whole point. As languages progress forward through their historical timeline, the pronunciation of certain letters changes. Sometimes, consonants actually end up as vowels. This is precisely what happened to the soft “j” in Mycenaean Greek. By the time of Homer, it had glided to the vowel “i”. Thus, the genitive singular masculine “ojo” in Mycenaean Greek was now pronounced “oio” in Homer’s Iliad. Now, the real problem here is simply this: when did the pronunciation start to imperceptibly shift from that soft “j” to the much softer vowel “i”? This question is in no way academic, but a reflection of the actual historical process of the gradual transformation, or glide (if you like) from soft “j” to the vowel “i”. Given that Mycenaean Greek was the predominant Greek dialect almost everywhere in Greece from at least 1600 BCE until ca. 1200 BCE, the glide may have already been almost complete by the latter date. But we have no way of really knowing. However, I am one of many Linear B researchers and translators who believe this is indeed what happened, even as early as four centuries before Homer wrote the Iliad and the Odyssey (if ever he wrote it at all, rather than merely reciting aloud). So at least some of us prefer to list the J series of syllabograms (JA, JE, JO & JU) as the Y series (YA, YE, YO & YU), in our belief that the glide from the soft “j” to the purely vocalic “i” pronunciation of this series of 4 syllabograms was already well under way towards the end of the Mycenaean era. It is far more likely that the earlier soft “j” held sway in Knossos before its final demise ca. 1450-1425 BCE, so the choice of which pronunciation you personally prefer is entirely arbitrary. I have no problem being arbitrary myself. Take your pick. In his comprehensive Linear B Lexicon, Chris Tselentis places QA immediately after PTE and right before QE, which is precisely where it belongs alphabetically in the Linear B syllabary. To classify QA as being only a homophone is to strip it of its actual true value, which is patently unacceptable. 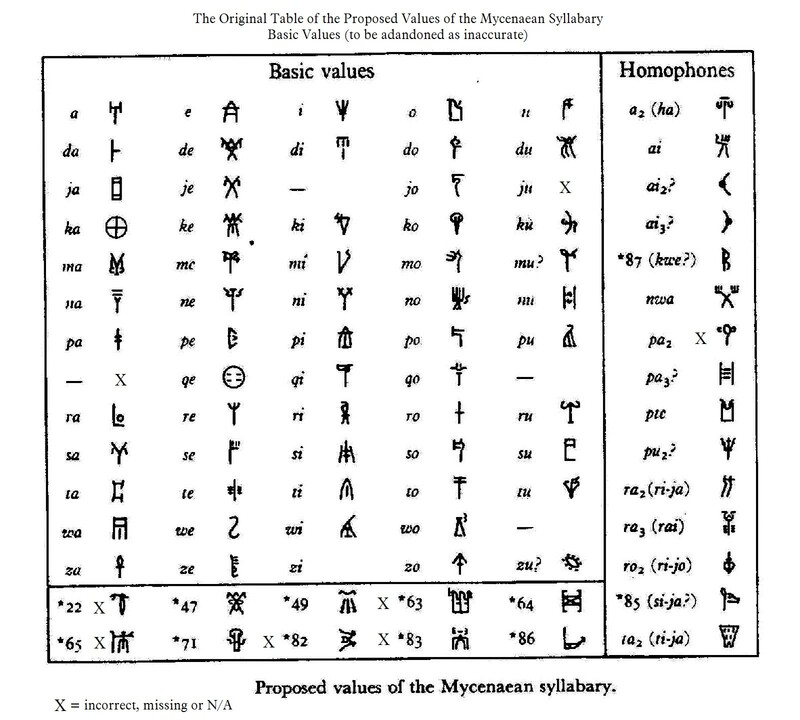 Unfortunately, the primary chart, “Proposed Values of the Mycenaean Syllabary”, which is the one practically everyone studying Linear B resorts to, is inaccurate & totally out-of-date on two vital counts. The new syllabograms (actually not so new), JU & QA are missing from that chart. Past Linear B researchers and translators, from Michael Ventris through to his colleague, Prof. John Chadwick, were mistaken in their interpretation of the syllabogram QA as a homophone only. Since it is now known that in fact QA is an attested syllabogram (A), the previous phonetic value Ventris, Chadwick et. al. assigned to it is neither here nor there. In order not to confuse Linear B students and researchers, I cannot be bothered rehashing its former value. This in no way detracts from their splendid work in the successful decipherment. It just took a number of decades for later Linear B researchers to finally realize that there was (and is) more to this little beastie than was previously believed to be the case. Since the Linear B syllabary has no syllabogram to account for either a B+ vowel or G+vowel series, QA, QE, QO had to stand in for both “ba, be, bo...etc.” & “ga, ge,  go...”  in Mycenaean Greek. If you still wish to read an early, but truly excellent, extensive study on the conjectural pronunciation of of a great many syllabograms, download the PDF file, The Linear B Signs 8-A and 25-A2 (Remarks on the Problem of Mycenaean Doublets), by Antonín Bartonek, translated by S. Kostomlatský (1957). This study clearly illustrates the then current belief that PA2, i.e. QA, was strictly a homophone... a belief which has not stood the test of time. In Fact, Prof. John G. Younger, one of the most esteemed Linear A & Linear B researchers of our time, has this to say about the Mycenaean pronunciation of QA. If you click on the Title Banner for Prof. Younger’s site below, you will be taken there, where you can view both the Linear A & B Grids. Scroll down to near the end of the page to view his complete chart of the Linear B grid.